READ this America... Haitians offer a good example of how to behave after the storm! I just read the article "What Haiti Can Teach Us About the Storm" by Jonathan M. Katz and it brought tears to my eyes. There is a fear of an imminent crime wave that is supposed to take place after the storm in the USA. This fear is being spread in issued warnings from news organizations. Jonathan M. Katz uses his on-the-ground experience during the Haiti earthquake to let American people know that the worse never happens after the storm and Haiti is proof! Contrary to popular belief, after the Janyary 2010 earthquake in Haiti, the poor and desperate Haitians didn't kill each other and the BIG SCARE that Haitians were going to be SO SO violent... Well... It didn't happen! 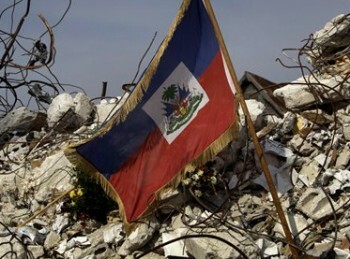 Having lived through one of the worst disasters imaginable, the article says, Jonathan M. Katz argues that the Haitians offer a good example of how to behave. After the Haiti earthquake, Jonathan says, 22,000 soldiers, sailors, airmen, and Marines were deployed to Haiti... "the U.S. military was the leading presence in the quake zone for months..." Surprisingly though, "law-and-order authorities found themselves with little to do. Most of the U.S. troops, sent to contain a societal meltdown, never left their ships..."
There was no social melt down! ...for those of us who called the quake zone home, it was a very different experience. The sense of community in Port-au-Prince didn't just unravel, but became stronger in those weeks after the quake, with people across Haiti putting aside vicious political squabbles and deep-rooted differences of race and class to focus on the immediate challenges of survival and coping with tremendous loss. Though authorities and many of my colleagues in the media fixated and exaggerated isolated pockets of presumed looting, lawlessness was isolated. You often hear of what wonderful people the Haitian people are... Let's just say it feels good to read this from a person who is actually paid to write about "the Haiti that sells newspapers"
And to you my dear reader, did you read the article yet? This is the kind of image we need to show the world, not fighting each other in politic all the times. I've always known if we stick together as a nation we will accomplish great things. Ladies and gentlemen, like I said in my book entitle Deja vu the collapse of Haiti, we are good people we just don, t have leader to us through progress. This is the kind of "real" perspective we need from a real journalist. I have always felt that the media exaggerates everything about Haiti; needless to say, Mr Katz just supported my conviction. Job well done!! And he should also be an example to the Haitian journalists who also concentrate on the negative aspects of their country rather than shedding light on the many attributes that make the country a symbol of strength, resilience, freedom, and hope..